In the last day, Hurricane Patricia in the Eastern Pacific Ocean has reached an unprecedented pressure of 880 mb and sustained winds of 200 mph with gusts to 250 mph. 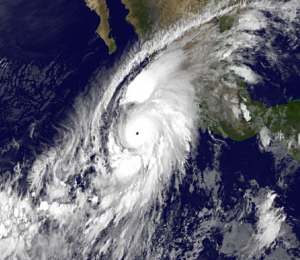 This is the strongest hurricane ever measured, although some past storms may have surpassed it but were not directly measured. No doubt its rapid growth has been aided by the unusually warm waters in the region due to the strong El Niño. It is a fairly compact hurricane, but the areas where it is expected to make landfall on the west coast of Mexico will face incredible winds and damage. When Typhoon Haiyan made landfall in the Philippines last year at similar strength, over 6000 people were killed. The landfall is predicted to occur just south of the tourist port of Puerto Vallarta. You can get more information on the hurricane at the National Hurricane Center http://www.nhc.noaa.gov. 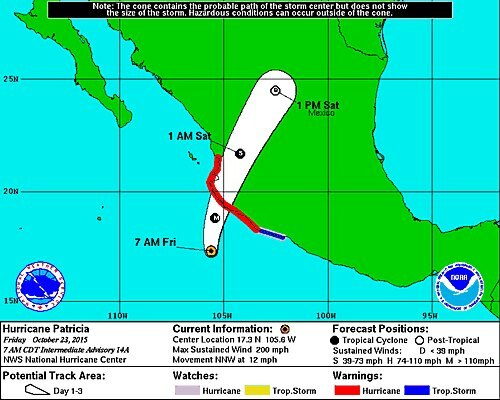 If you have family in the area or family or friends with travel plans to Mexico, they should follow the conditions carefully. 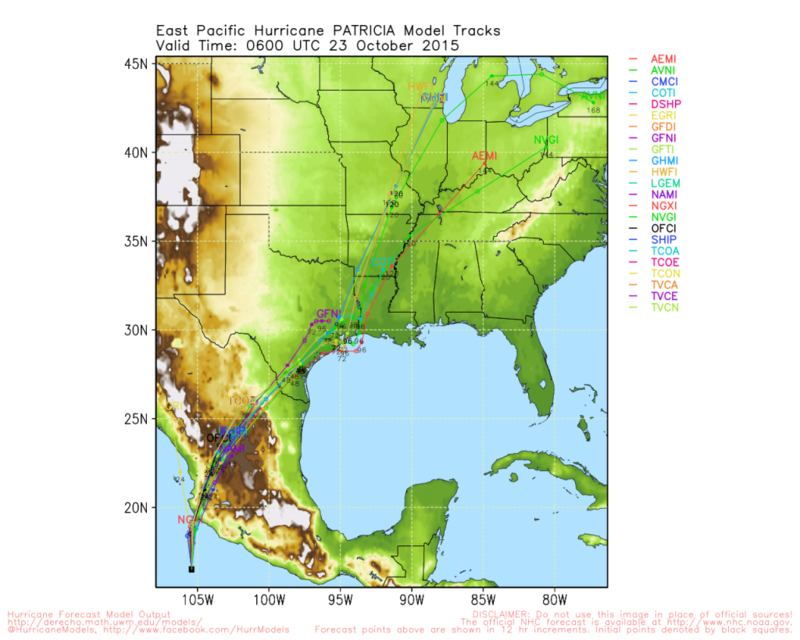 Will the rain from Patricia affect us in the Southeast? While the tracks from computer models so far indicate that the center of circulation will probably move to our west, the moisture from the storm will most likely feed into the front that brings rain to the Southeast next week, so indirectly we could see some enhancement of the rain. But the effects are likely to be minor since the extra moisture will be spread out over a wide area. I will update you as things progress. Impacts on Mexican agriculture are likely to be severe in the low-lying croplands just to the right of the storm’s path. The storm surge could reach 25 feet or more. The water could be piled up even more in local bays that are oriented to trap the surge and focus it. There are also some biological research stations and preserves which could be severely impacted by the winds and surge. Please keep the people of this area in your thoughts and prayers as they go through what could be a major catastrophe.